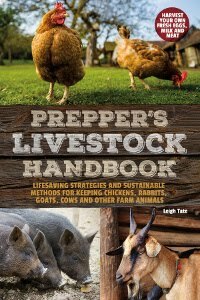 If the title of this post puzzled you, and the photo of that patch of pretty grass offered no clue, then chances are you haven't read much Gene Logsdon, one of the most helpful authors for homesteaders and small farmers. You can read all about his pancake patch here. On the other hand, if I had entitled this post "My Wheat Patch", it would have been crystal clear. But what fun is that! One of my goals for the year, was to experiment with growing grains. I had a successful go with amaranth for chicken and goat feed, but the one I really wanted to try was hard wheat. Wheat is commonly grown on plains areas, not the southeast US, so I wasn't sure if I could even do it. Still, I wanted to give it a try and see what I could learn. It only took a little research to discover that wheat can indeed, be grown in my part of the country. The reason it isn't commonly seen, has more to do with commercial interests rather than homesteaders' interests. To grow wheat for bread making, I needed to grow winter hard wheat. This simply means wheat sown in the fall rather than the spring (i.e. spring wheat.) Hard wheat is used for bread baking because it is highest in gluten, the protein which gives bread dough the elasticity needed for a good rise. Soft wheat is starchier, with less gluten, and makes tender baked goods. I didn't buy special seed, I just used wheat berries I had on hand. Dan tilled compost into last summer's 5 by 25 foot cucumber patch, and this because my experimental pancake patch. It sprouted in less than a week and all I can say is so far so good. 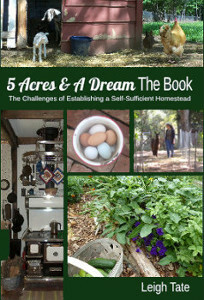 Homegrown Whole Grains: Grow, Harvest & Cook Wheat, Barley, Oats, Rice, Corn & More by Sara Pitzer. Gene's book is the kind you can sit down and enjoy from cover to cover, while Sara's is more reference style. Both are loaded with excellent, practical information for folks like us. I will be eager to see your harvesting of the wheat. I have been tossing around growing grains and may try a few in the spring. I am still thinking about that cook stove. I love it! Hopefully it turns out well! I'd be interested to know the yield. We're haphazardly trying to grow some wheat this year too, but not near as much. We've got some growing in a 2x3 raised bed. And we've got some growing in a few spots in the yard where I spilled a bunch and then the dog... uh.. helped us spread the seeds. It comes up quite a nice green color. What a great trial - breads from fresh ground wheat are soooo good. You are going to be another expensive influence on me like my dear friend Jane...aye! Jane, try a small patch! Carrie, I've seen wheat grown by a smallholder and even helped with the harvest. We probably wouldn't have thought much about it either, except that we are working toward food self-sufficiency. I figure I'll start small and see what we can manage. Bear, hey, something is better than nothing, that's my gardening philosophy. :) I'm curious about the yield too. I have a new 50 lb bag of wheat berries that I plan to keep track of as I use it, just to see how long 50 lbs lasts us. That and the patch should give us at least a general idea of what we'd have to do to grow all our own. Isn't that the thing about gardening that keeps us going? There is ALWAYS something new to try. (And sometimes the experiments is even successful(!) and we end up growing it as a permanent crop!) If we don't try, we'll never know if we can do it or not. Mama Pea, that's exactly it. Always something new to try. With seed catalogues just starting to arrive, I've got a whole long list of new things to try. I think esp. with grains the recommendations are mainly for commercial growers. why shouldn't it grow for you, if you don't have to harvest a minimum of so many kg per sq.yd. if you don't put out enormous amounts of fertilizer and can sow/pick only by hand, it will likely be less than a prof. grower has, but still, you know what went in and I am sure it's perfectly edible! When we grew winter wheat a while back in a 4 by 50' row I ended up with just over a gallon and it was really fun to grow. I hope yours does well and look forward to hearing more about it. One of these days I hope to grow all of our own wheat but we are not quite ready for that project yet. I'll be watching and see how it goes! I did that quite a few years ago. I don't remember the size of the patch but I do remember the yield was good. Why haven't I tried it here? I will have to try next year. You truly inspire me!! Bettina, good point. So far I've gotten encouraging comments, so I am hopeful. And it looks pretty good after three days of hard freeze! Mr. H, thanks! What an amazing collection of videos Paul Wheaten has. I going to have to explore his forums too. Excellent resources. Alla, another success story! Yay! This is the first year I've paid attention to yields. Not in terms of weight, but in terms of how much yield I get from how much I plant. The question, 'how long will it last' is on my mind a lot lately! So, do you have any sugar maples you can tap next February? Hey Leigh! Just for reference, we grew 40X100 feet of hard wheat last year and it yielded about 50-60 pounds of berries. We were a little weak on soil fertility in a few areas so I think we could have done a little better in the best case scenario. Anyway...there's some ideas on hand harvesting over in my blog under wheat posts. And thanks for your support. I am so excited to find your blog! I'll be stopping by often. Country Sister, thank you for that! Very helpful information. I will definitely check out your wheat harvesting posts. Sharing information is what blogging is all about! A pancake patch -- brilliant title, and what a good idea! Where did you get the original wheat berries? Zev, I love the title too, but the credit for it has to go to Gene Logsdon. LOL. I used wheat berries from the 50 pound sack I bought at a bulk food store for grinding into flour. I figured I'd just give it a try. We'll see how it works out! Linda, it's kind of exciting to be trying this. I just hope the follow ups are of success! I'm excited too to see your results. 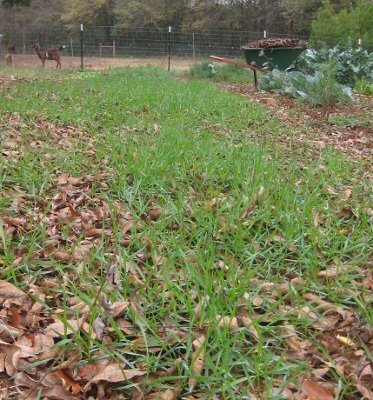 We've grown millet and amaranth with great success but have never tried wheat. That soft wheat is perfect for cakes and quick breads as well as biscuits, so why not grow that too? It's what the south grows best! Ozark, our goal is to eventually grow all our own grain. In the course of things I hope to work out a rotation based on need, but I'm sure that will take some time. I did well with amaranth too, but I just feed mine to the goats. Have you used yours for cooking?